Keeping the Niantic River clean and safe is up to us. Get involved! What Can YOU do to protect the River? We have a new raffle!!! with a 2.5 hp Brand New Yamaha Outboard. Includes: 2 Oars, Carry Bag, Inflation Pump, Repair Kit, Hose and Adapter for Pump. All Donated by Boats, Inc. (Niantic) Thank you!! June 7, 2019 at 4pm. and continously at Boats Inc, Niantic at their Parts Counter up to just prior to the drawing on June 7, 2019. Thank you for making our December fundraiser such a success again this past year! As Eileen says "Our members are the backbone of our organization!" The Petition #1347 with the CSC has been denied without prejudice - which means they can come back under the same Petition IF they do all the things that were specified by the Council in the denial letter. We are Intervenors in CT Siting Council 1347 Petition for a Solar Power Installation in a forested area between Oil Mill Brook and Stony Brook in Waterford. They are headwaters for the Niantic River Estuary. The run-off from such a large solar installation will directly affect both Brooks, the Niantic River and the LI Sound. The company proposing this installation is the same one that created the wetlands disaster with their installation in East Lyme on Walnut Hill Road. We are bringing that info to the Council and are able to ask the Petitioner questions that they have to answer for the Public to see. We have hired Bruce McDermott from Murtha Cullina, LLP and Professional Engineer Steve Trinkaus to help us get our voices heard about the potential destruction this installation could cause for the both Brooks and the Niantic River. STR-STH is pro-solar. Just not at the cost of Water Quality for the Niantic River Watershed. Click Here for our Fall newsletter for more and we will be posting on Facebook as we go through the CT Siting Council's process. 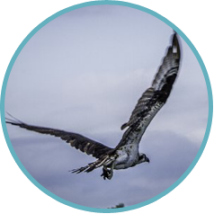 Thanks to the Save Oswegatchie Hills Coalition for putting together a wonderful new video about the Hills and why they are so important to protect and preserve. Click Here to Watch it ! Feel free to share the video with your family and friends in your social media! Congratulations to Stephanie who won the Kayak & Paddles in our free KR drawing! Also winners: Cordette - Life Jacket; Mike t-shirt; Corenne - STR-STH Beach bag; Jimmy - STR-STH hat. Thank you all for coming out on our beautiful river in support of Save the River-Save the Hills! "Thank you very much for reporting what you saw. The fish that you photographed are menhaden (bunker). It is not uncommon to see dead menhaden during the mid to late summer. Sometimes the kills are quite a bit larger than what you witnessed. It's a natural occurrence. These fish enter, or are often driven by bluefish and other predators, into shallow confined areas. In such areas, the water is warm and does not hold much oxygen. What oxygen is there is quickly consumed and the fish die. Click on the Facebook icon above - see the latest! We are a charity on AmazonSmile!​Go to www.Smile.Amazon.com & sign up for Save the River-Save the Hills as your chosen Charity. Then make Amazon purchases like normal and we get a percentage of all your Amazon purchases!! 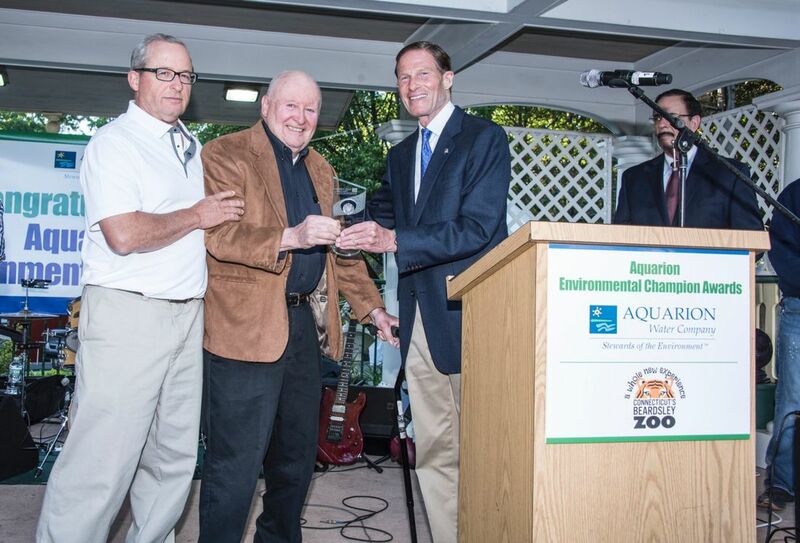 Congratulations to Fred Grimsey, Founder and President of STR-STH for winning a 2017 Aquarion Environmental Champion Award!! "In 2003, Fred Grimsey’s concern for the health of the beautiful Niantic River in southeastern Connecticut and its surrounding communities hit the tipping point. More people than ever were enjoying swimming, fishing, clamming and all manner of water sports in the river and tidal estuary. But with all the boat traffic, the river was becoming a growing repository for raw sewage pumped overboard. So Fred took it upon himself to do something about it. With his own money, he bought a boat and equipped it to pump out the waste tanks of pleasure craft using the river. Then he took what we politely call “pumpage” to an environmentally safe treatment plant on shore. And all at no cost to the boat owners. Fred ran that pump-out service for two years out of his own pocket. It soon caught the eye of the state and now it’s fully funded by the Connecticut Department of Energy and Environmental Protection. Last year, Fred’s program alone kept 16,000 gallons of sewage out of the Niantic River and Long Island Sound. Even more important, his efforts inspired similar pump-out programs up and down the coastline. When he wasn’t out on the river, Fred was busy founding and nurturing a new non-profit called Save the River – Save the Hills. And its successes have only grown – and grown and grown. He’s worked tirelessly to defend the remaining natural areas of the Niantic River watershed and preserve them in their unpolluting, scenic state – including 236 acres that are now protected along the river itself. And Fred is still at it. In 2012 he launched an all-volunteer Water Quality Monitoring Program. Again using his own boat and funds, the program revealed bacteria levels in some parts of the river well above levels that would close beaches elsewhere in the state. With boaters no longer contributing to the problem in any major way, Fred is now tackling ways to reduce the amount of runoff that with every serious rainstorm sluices off roads, lawns and parking lots, polluting a waterway treasured by thousands. 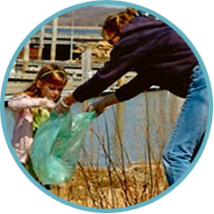 Aquarion is proud to honor Fred Grimsey with its 2017 Environmental Champion Award in the Adult Category." Preserving the health of the Niantic River Estuary and the natural beauty of the Oswegatchie Hills that overlook the River is crucial not only to the local people who boat, swim, fish and live along the River, but also to the well-being of the entire Long Island Sound. The River is a Tidal Estuary emptying directly into the Long Island Sound carrying with it all the runoff from its entire watershed. For the past 15 years both the Niantic River and the Oswegatchie Hills face a major crisis--the threat of development of an 1700+ unit condominium complex within the Oswegatchie Hills - right on the River. 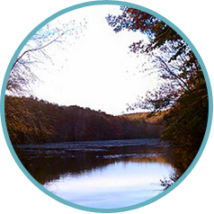 Save the River-Save the Hills works tirelessly to keep the Niantic River clean and ensure that the Oswegatchie Hills remain unspoiled, but we cannot do it alone. We need people like you to help us turn the tide. Won't you join us? 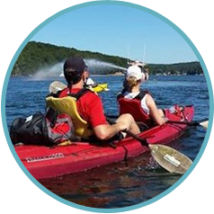 HELP KEEP THE NIANTIC RIVER CLEAN AND THE OSWEGATCHIE HILLS GREEN. CLICK TO JOIN TODAY! © 2014 SAVE THE RIVER - SAVE THE HILLS, INC. All rights reserved.